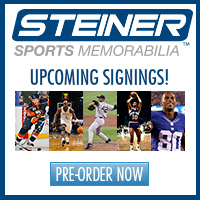 Steiner Sports has launched a new searchable database for autographs acquired during its signing sessions. In March of 2015, the company began affixing its new tamper-proof hologram, each of which contains individual serial number, to all of its eye-witnessed autographed memorabilia. The new hologram is visible on all physical bats, balls, jerseys, sticks and other items that are sold. Those who have acquired an item from Steiner Sports that was autographed and authenticated since March 2015, can go to a designated web page to see the associated product, the date it was signed and other details. Serial numbers must begin with the letters “SS” in order to be able to use the new authentication program. To promote the free service, users of SteinerSports.com/hologram who provide their email address will be entered into a random drawing to win an autographed Derek Jeter baseball.